description: A large six (6) piece Stag Beer porcelain enameled neon sign. Two (2), 80" side signs connect to the single front sign, 48", forming a marquee. Three (3) addition signs are mounted below offering "Liquors", "Fine Food" & "Wines". All exposed edges have porcelain corners and the top front sign has a deco element. 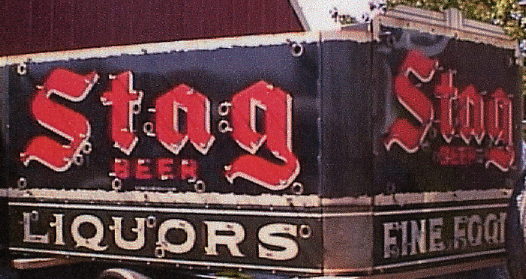 information: This sign was commissioned by Stag Beer owners: Griesedieck Western Brewery of Belleville, Illinois.